Dimensions 1 by 7.50 by 9.75 in. Amazon.com description: Product Description: Operation Strategy Second Edition Nigel Slack and Michael Lewis Ideal for Advanced Undergraduate and Postgraduate students, this book builds on concepts from Strategic Management, Operations Management, Marketing and HRM to give students a comprehensive understanding of Operations Strategy. Features *Comprehensive and accessible with authoritative authorship and an excellent blend of theory and practice *A European context *Engaging case studies *Teaching resources including an Instructor's Manual with extensive case notes and PowerPoint slides at www.pearsoned.co.uk/slack. What's New? *This new edition has been focused to concentrate on the most significant topics in the subject, with 10 chapters replacing the previous 15. New material has been added and coverage of some older topics has been revised (see new table of contents). *End-of-chapter case exercises have been replaced by a major end-of-book section of Harvard-type' cases. *New to the Instructor's resources online: additional cases and a set of questions and answers for class use / exam use. * New coverage of hot topics, such as the implications of ERP and Six Sigma on ops strategy, agility and it's inter-relationship with lean, supply management issues, operations strategy for competitive advantage and SCM, and implementation. 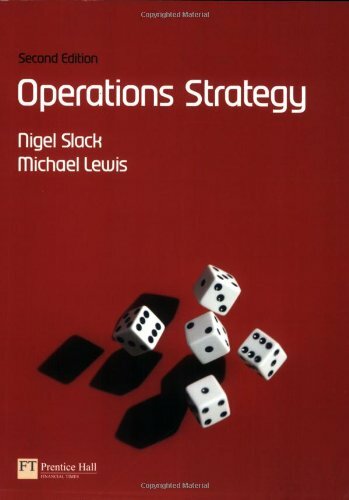 About: Operation Strategy Second Edition Nigel Slack and Michael Lewis Ideal for Advanced Undergraduate and Postgraduate students, this book builds on concepts from Strategic Management, Operations Management, Marketing and HRM to give students a comprehensive understanding of Operations Strategy.